Probably my favourite trio around town - partly due to the playing, partly due to the style. 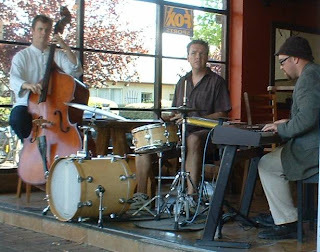 WKT are Wayne Kelly (piano), Ben O'Loghlin (bass) and Mark Sutton (drums). WKT is playing 3-5pm alternate Sundays, at Edgar's Inn in the Ainslie Shops. Today they played some originals, but mostly standards. All in a modern interpretation, with excellent inventiveness and close interaction. Mark is master of the brushes. Wayne is endlessly inventive, and often joking on the keys. Ben is with them all the way, and taking lots of solos in this environment. An education in laid-back intensity. Catch this band! OP were playing at Hippos' last week. OP are currently Michael Coggins on guitar, Ben Braithwaite on drums, Munro Melano on keyboards, and bass (I didn't recognise the bass player, my apologies). Plenty of original tunes, in a modern, relaxed, and I thought TV-like vein. There should be some money for this in the studios. Solid bass lines, with inventive solos. Plenty of Rhodes sounds, and a very funky Hammond at one stage. I forgot the camera so no pics. Here's a new venue for CJ. Edgar's Inn is located in the Ainslie Shops. Jazz 3-5pm, every Sunday afternoon. 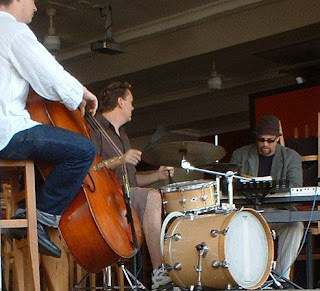 Today (and alternate Sundays) is Wayne Kelly's Trio. I don't know who plays the alternate week. Also "funk/jazz" on Tuesday nights. Very pleasant sitting with a beer on a warm afternoon, and the jazz was excellent. Nils Rosendahl has just gone OS to Asia and a scholarship to study in the UK. He's a great loss to Canberra. Niels was a star student of saxes. Here's a pic of Rosendahl's Pardi with Strings from Moruya 2005. Niels Rosendahl, saxes; Anna Thompson, violin; Michael Azzopardi, piano; Ben Rogers, bass; Ben Braithwaite, drums. A worthy final concert for Sat night: lively and well played. I remember especially Corea's Spain, and Rosendahl's post-bop Penguins. Nice one, Niels. It's not strictly Canberra Jazz, but it happened here. The catholics came to Canberra to perform for the Multicultural Festival, and also for a more intimate performance at Hippos. I had seen them years ago, mid-90s or thereabouts. At one stage during the night, Lloyd Swanton said they’d been together for 14 years, so they were already well established. They all have other projects. They have just recorded their 5th CD (or 4th and a compilation?). Some players were still there from the concerts I saw 10 years ago – Lloyd Swanton (bass), Sandy Evans (tenor & soprano sax), James Greening (trombone, and a very little trumpet) and Fabian Hevia (percussion). The guitar, drums and slide players are changed. I was most blown out by James Greening. Stunning, clear, articulated trombone solos – it’s rare that you hear postbop-style lines like this on a trom. And Sandy Evans was superb. She’s little, and the tenor practically reaches her knees, but her lines are big and complex. Plenty of lyrical playing, but with detours into sheets of notes at varying levels of dissonance. And together, Sandy and James create these hauntingly beautiful and precise harmonies which define several of their tunes. The whole was put through a JBL rig with sub-bins and mid/high boxes. Rare for a jazz-related gig, but more balanced, compressed and powerful. I enjoyed it, but I did hear negative comments about it being overpowering. It was not rock-loud, but still pretty solid. The overall effect was rich and accurate, with stunning competence in solos, and beautiful, lyrical melodies against the rhythmic complexity that you can only get with a large rhythm section. The catholics are: Lloyd Swanton (bass), Sandy Evans (saxes), James Greening (trombone), Jonathan Pease (guitar), Bruce Reid (lap steel guitar, dobro), Hamish Stuart (drums), Fabian Hevia (percussion). They are running an email list if you wish to find out more, but I coudn't find a URL. Good luck. Here's a glance into our history. The Canberra Jazz Club represents the trad end of the jazz spectrum. They get together at regular performances of the Black Mountain Jazz Band at the Dickson Tradies, and meet with other trad jazz clubs around NSW. See their website.